You can provide your own sciatica pain relief, in the vast majority of cases. The solution is most often not complicated, it's just in a different place than the average person would think. Just follow along with the videos below. Intro, Video 1, Video 2, Video 3, Video 4 . Your sciatic pain may be fixed immediately from doing only Step 1. You may notice a substantial difference from any of the techniques in these videos that can help relieve the pressure on your sciatic nerve. So pay attention to what works best for you as you go through this entire series. So as you can see from the video, this is a very powerful way to stretch the big muscles in your buttocks. The power comes from the leverage you have when you shoot your arm over your shin and then reach through the hole in your legs to grab your forearm. I'd encourage you to play with stretch to get the most out of it. You can try the sustained slow stretch at first, but then play with flexing and relaxing the muscles you are stretching to see if that improves the stretch. You can also pull on your bent leg at slightly different angles to see if that gets at any other tight areas you may have missed with the standard stretch. And, as I always recommend, switch from side to side and see if each time you return to a side that it's improved from the other side releasing tight tissue. Was your sciatica pain reduced from doing this stretch? Once you are in position with one knee bent in front of your and one knee bent behind you, the first thing you want to do is make sure you don't feel this stretch in your front knee. If you feel it in your knee, then you need to change the position of your front foot. Slide your foot further away from you a bit, or bring it closer to you a bit and you'll find a spot where you can do this stretch without it hurting your knee joint. Now, when you lean forward over your shin to do this stretch, I want you to take on the role of an "investigator" who is seeking out tight tissue to stretch and the proper angles to get at it. So, lean your chest over your shin and notice where you feel the stretch, but then lean a bit more toward your knee and notice where you feel the stretch. After that, lean forward more over your front ankle and notice where you feel the stretch. As you notice and discover new tight areas, take your time, go in and out the stretch, go to other areas and come back. You can always do the stretch on the other side of your body and then come back and see what's changed. Once you take on the role of an investigator with any of the techniques I show you, then you're really empowered to find your own patterns of inappropriate tension, find them, release them, and provide your own joint pain relief. Was sciatica pain relief noticeable from this one stretch? Take notice. Once you are in the correct seated position do take the time to find a comfortable position to do this stretch in. Sometimes you do have to adjust yourself a bit so you can get the right leverage to do this stretch. When you're in the right position there should be any real strain to feel the stretch on the side of you hip. Gentle but firm twist of your shoulder girdle into your knee should provide the force you require to feel a good stretch. As with the other stretches, make sure and perform this stretch on both sides of your body, even if the other side doesn't seem to hurt. Your job is to release as much inappropriate tension in your pelvis so that your sciatic nerve is no longer being aggravated. Was there substantial sciatica pain relief from this stretch? These techniques to release your hips are highly effective. You may have to play around a bit, but it will be time very well spent. Basically, we'll be releasing all the muscles in your buttocks. From all the soft tissue by the bottom of your tailbone, to all the soft-tissue up to the top of your hip bones, and all the way out to the head of your femur (leg bone). We'll be using the tennis-ball-press technique on any tender spots we find, BUT we'll be using not just a tennis ball, but a baseball, lacrosse ball, softball, etc. to find what ball is most effective in different areas of our buttocks. Notice how much sciatica pain relief this technique provides. If done properly this can be can extremely effective way to get rid of your sciatic pain. These two techniques to release your hamstrings are well worth your time and effort. You can do these techniques as often as you would like. The more you do them the more they will generally only help you achieve the sciatica pain relief you are seeking. If you do happen to have a softball handy, it can be quite beneficial to release some tension in your hamstring using it before we do the stretch described below. The press-hold-move technique and the tennis-ball-press technique (except we're using a softball) are what we'll be using to manually release your hamstrings. As you can see from the video, it's pretty straightforward. Sit on the ball, find some tender/painful tissue and then bend and straighten your leg to get that tight tissue to move under the pressure, so it can release. Was there noticeable sciatica pain relief this one technique? Was there noticeable sciatica pain relief from doing this stretch? The press-hold-move technique. using the tennis-ball-press technique is a fantastic way to get into, and then release this small but very important muscle on the side of your hip. Take your time, get that ball pressing into some tight tissue and then bring your knee up toward your chin and then down toward your foot. You can also use your fingertips to do the old reliable press-pull-release technique. If your Tensor Fascia Latae isn't too tight your fingertips can sometimes be enough to get it to release. Try both methods, so you have the experience. Do both sides of your body. Notice how much sciatica pain relief this one technique provided. Now do the exact same hand-on-hand technique with the press-pull-release technique as in Step 3A (just above) except on the very side of your leg (iliotibial band). You can sit or lie on your side while you do this with the side you are working on facing the ceiling. From your knee to your hip bone, all the way up the side of your leg notice any tender spots. Press on the tender spot, while still pressing pull on that tissue a bit like you are trying to stretch it with your fingertips, and then slowly release it. Repeat that a number of times on each tender spot as you move up your leg. 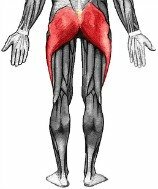 You may notice at the very top to the side of your leg, there is a small muscle (tensor fasciae latae). Pay extra attention to this muscle, and do a few extra rounds of "press, pull, release" on it before moving on. If it's really stubborn, you can lie on a tennis ball to get more release from this muscle and do the tennis-ball-press technique to perform the press-hold-move technique. Notice how much sciatica pain relief this one technique provides for future reference. Your vastus lateralis muscle can be a big player in any chronic pain issues in and around your pelvis. Investigate the entire outer third of the front of your thigh for tight tissue. Then use the press-pull-release technique with the assistance of the hand-on-hand technique to work any tight tissue like it's clay to get it to release. Tension in this muscle in either leg could be playing into your pain issues, so do investigate and release both. For those interested, my Best Quad Stretches Page (click here) shows you how to do a hand-on-hand technique to release your vastus lateralis. 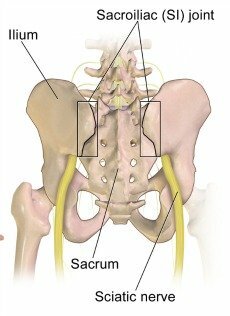 To what degree did releasing this muscle help your sciatica pain? Is your sciatic pain completely gone? Partially gone? Which techniques gave you the most sciatica pain relief? Are you still experiencing some mild sciatic pain? Which muscles are still tender (that means they are tight!) and could use some more work? Investigate a bit and you'll eventually find which techniques work best for you to provide the best sciatica pain relief. Then you'll be able to fix yourself whenever you desire because you'll have your own personalized sciatic pain remedy……literally at your fingertips!